Marine biologist, environmentalist, and naturalist Rachel Carson was born in 1907 in Springdale, Pennsylvania. Raised on a farm, Carson developed a deep love and first-hand knowledge of nature and wildlife. In 1929, Rachel graduated from the Pennsylvania College for Women (now known as Chatham University.) She attended graduate school at Johns Hopkins University, earning a Master’s degree in zoology in 1932. Carson wished to pursue a doctorate but was unable to gain the degree due to family financial difficulties that required her to get a job. Following her studies at Johns Hopkins, Carson joined the U.S. Fish and Wildlife Service in 1936. Her first book, Under the Sea-Wind (1941), beautifully described marine life for the public in non-scientific terms. In 1951, Rachel published her second book The Sea Around Us, which was a best-seller and received the National Book Award. The book’s success gave Carson financial security which allowed her to leave government service and devote herself exclusively to research and writing. 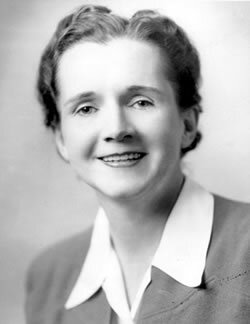 For the rest of the decade, Rachel Carson conducted research into the effects of pesticides on the food chain. Her conclusions were published in the groundbreaking study entitled Silent Spring (1962). This influential work chronicled the harmful effects of indiscriminate use of pesticides. Silent Spring reached a large audience and influenced environmental public policy. It also met with fierce opposition from chemical companies and pesticide producers. In the book, she focused upon and condemned the widespread use of the pesticide DDT, which led to legislation banning the use of DDT and other pesticides. The popularity of Silent Spring led to an increasing drumbeat for improved environmental policies, and is considered a major impetus behind the establishment of the United States Environmental Protection Agency (EPA). 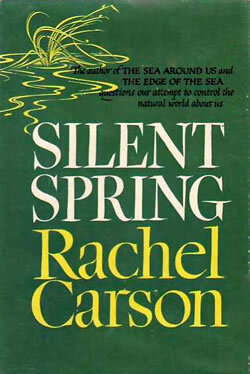 Following the publication of Silent Spring, Rachel Carson received many prestigious awards, including the the Audubon Medal (National Audubon Society), the Cullum Medal (American Geographical Society), and induction into the American Academy of Arts and Letters. Rachel Carson died of a heart attack and complications of cancer in 1964. Carson was posthumously awarded the Presidential Medal of Freedom by President Jimmy Carter in 1980. - Carson: Employee photo from the U.S. Fish and Wildlife Service, 1940.